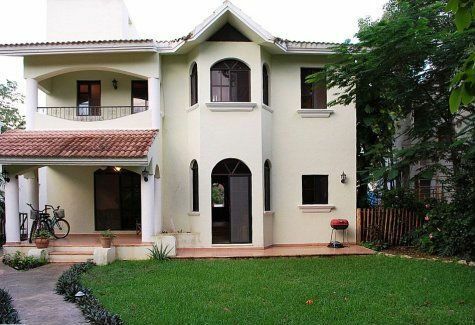 Playacar Golf Course Community, Playa del Carmen - This is a beautiful, fully furnished 2-story Mexican Colonial villa located in the exclusive golf course community of Playacar and inside a secondary gated neighborhood called Club Real. The ensuite upstairs master bedroom with balcony and dressing area stretches the entire width of the house and provides a wide overview of the back yard. The 2nd bedroom upstairs in front is also ensuite with a balcony overlooking the front yard. The upstairs 3rd bedroom may also serve as an office complete with telephone, TV cable and high speed wireless Internet connections. All bedrooms have connections for Cablemas cable TV. The main floor has an open floor plan with a half bath, laundry room with washer and dryer and lots of windows looking out over the lovely fenced back yard and tropical gardens. There are fans and air-conditioning units throughout the home and the house is wired for telephone, cable TV and high speed internet access. 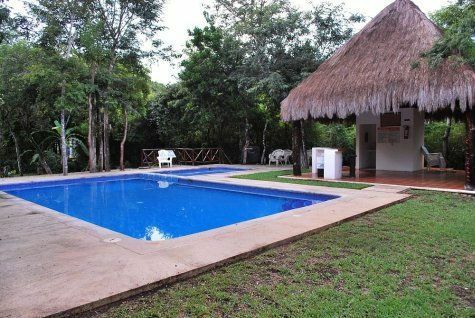 Built in 1999, this house has 2400 square feet (221.93 m2) of living space and is situated on a lush green 449.42 m2 lot. This house is located on a quiet cul-de-sac just a 2-minute walk to the pool, a 5-minute walk to the tennis courts, and a short drive to the most beautiful beaches in the world. Guests living in Playacar Phase 2 receive VIP access to the Reef Beach Club and reduced greens fees at Playacar's world class Golf Club. Contact us today for a private tour of this lovely home.